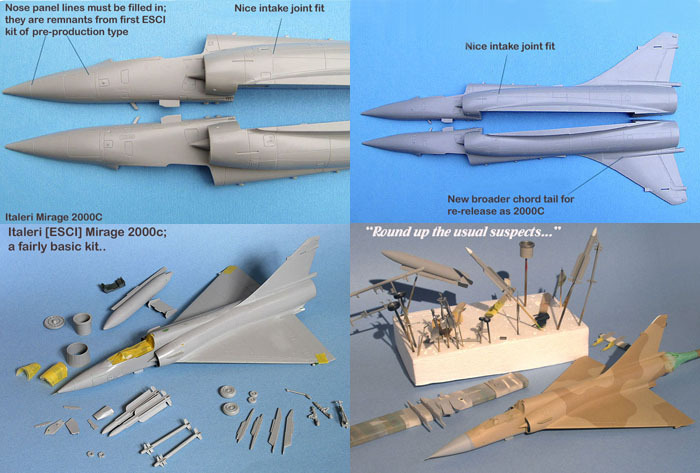 Here are two Mirage kits in 1/48 scale, the Heller 2000C kit 80426, and the Italeri 2000C kit 2614. I caused myself a spot of trouble with the wing root joint on the Heller kit as I didn't join the upper wing sections to the fuselage sides first and then add the lower wing section later. I didn't make this mistake with the Italeri build. I found the overall fit of the Italeri kit to be somewhat better than that of the Heller - the molding is much crisper and the plastic much smoother, although the panel lines on the Italeri may be a bit too deep for some tastes. The cockpit and seat of the Heller look much more accurate than the Italeri kit, which hasn't changed at all since a pre-production version was issued in the early 1980's; at the very least a new seat is needed for this kit. 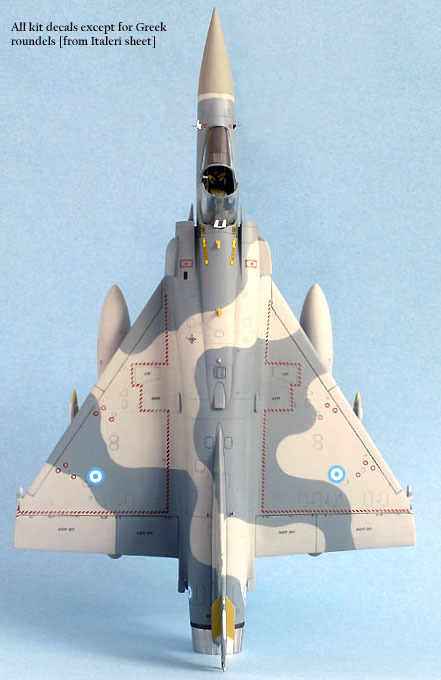 Model Master paints were used on both builds: for the Hellenic Mirage Dark Ghost Grey is the ligher color, and Intermediate Blue lightened with Classic White, the bluish hue. 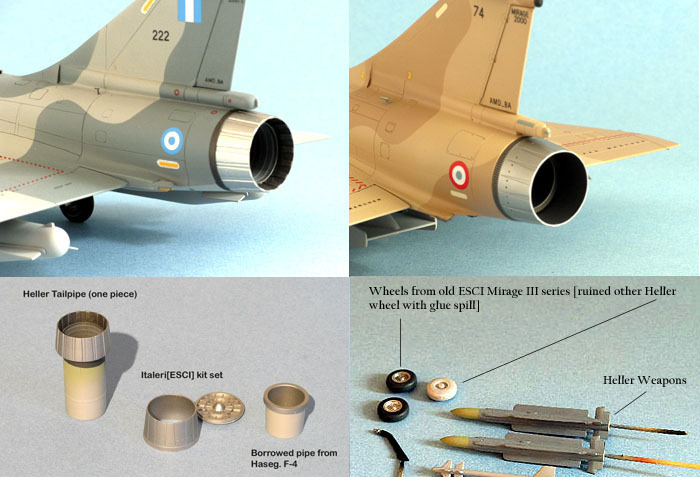 The Gulf War Mirage was done using Radome Tan and Dark Tan; I added some Dark Tan to the Radome color to get that light Sandy color; and added some Classic White to the Dark Tan to get a sort of Intermediate Tan. [all eyeballed from color pics]. The respective kit decals were used throughout the finishing-only the Hellenic roundels were borrowed from the Italeri sheet. The Heller/Airfix decals (although extensive) are concomitant with the overall quality of the plastic-they just don't quite make it! But I used 'em anyway; Heck, modeling is probably the least risky thing I do in my life ! The Italeri sheet is well-printed and go down nicely on a good glossy surface. 'Nuff said ! I added a bit of [spurious] detail to the Italeri cockpit-the consoles and front panel are decals.Also a HUD from scrap PE. There is a Black Box cockpit set for the Heller 2000C, but according to Lin, Bo Shiun (Stephen) whose fine article[ Modeling Madness] on a Taiwanese 2000-5 was the inspiration for my -5, the resin tub needs lots of sanding and dry fitting to get it right. 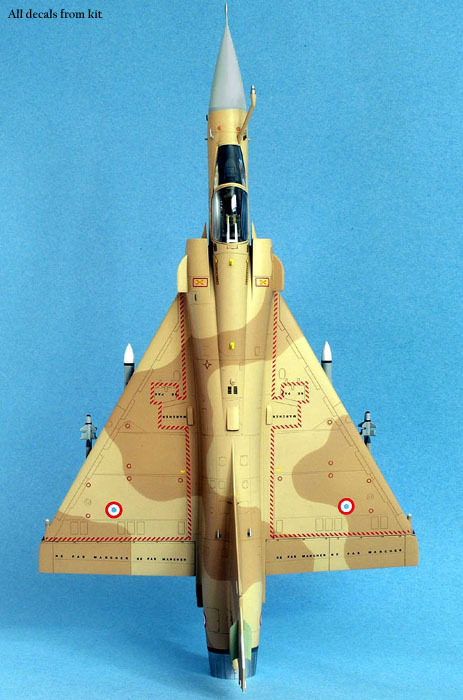 It should also be noted that I anacronised my Gulf War Mirage 2000C by simulating the Spirale [chaff] dispensers at the rear of the wing fairings; I had not originally intended this build to be an 'Operation Daguet' aircraft. The dispenser (decoy) shortcomings of the Mirages appearing over Bosnia and Kosovo were corrected by these Spirale additions. As with so much in the area of modeling esthetics, the beauty (and the beast) is often in the eye of the beholder. I didn't do any measuring or such but to me the Heller/Airfix kit is probably more 'accurate', i.e. 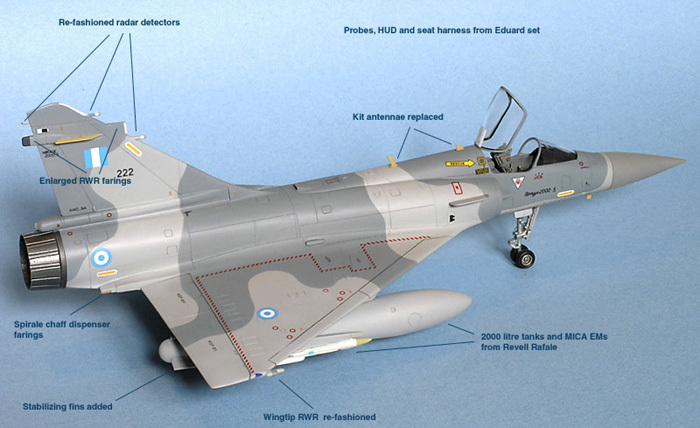 from the many Mirage 2000 pics I've looked at, it appears more 'proportionately correct'. 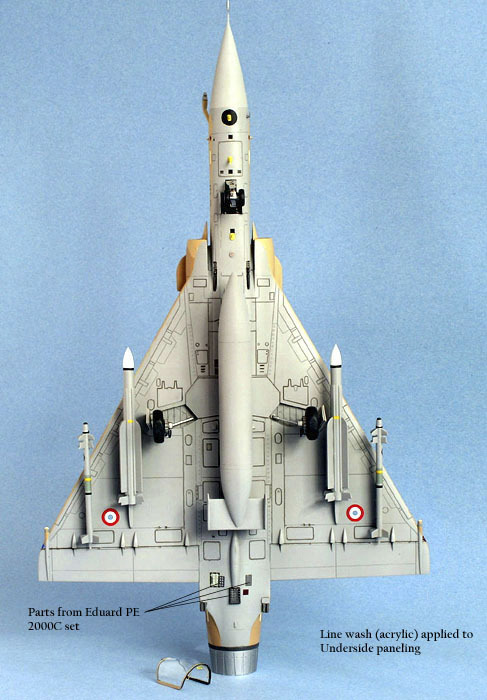 The Italeri/ESCI fuselage looks to be too thin in cross-section; but in profile the model looks just right.! What I'm left with is the feeling that the Heller kit is one of those 'Could-Have -Beens'; the look and proportions are all right but the molding and the plastic are sort of rough which throws the fit off...etc. If Pro Modeler from Hong Kong had done the same kit from the same specs we might have had a first class model...A l'autre main, the Italeri/ESCI kit is quite well-done; crisp molding and smooth plastic-but looks, so to speak, a bit undernourished-perhaps like one of those svelte runway models from Milan. The alternative for the 1/48 scale builder is the old Monogram kit, now out of production but still showing up here and there. Some have called it a tad on the plump and short side [too many Big Macs ?! ], but if given a new radome and seat it looks just fine. 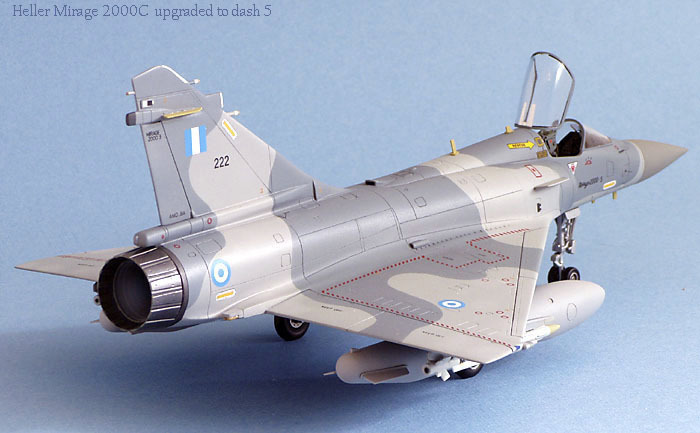 There is no definitive Mirage 2000 in 1/48 scale (or any scale as far as I know). There may never be. The major modeling firms have never produced one, maybe for any and all of the reasoned theories that we see discussed on HyperScale about such things. 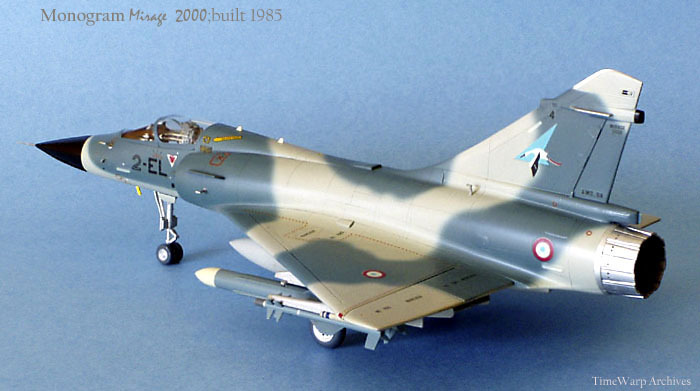 References for this project came from two Air Forces Monthly articles; The New Mirage 2000 [Feb. 2000]; Gallic Warriors-The Mirage 2000N and 2000D [July 2001], and the Concord Publication, Operation Daguet-French Air Force in the Gulf War by Eric Micheletti (1991).